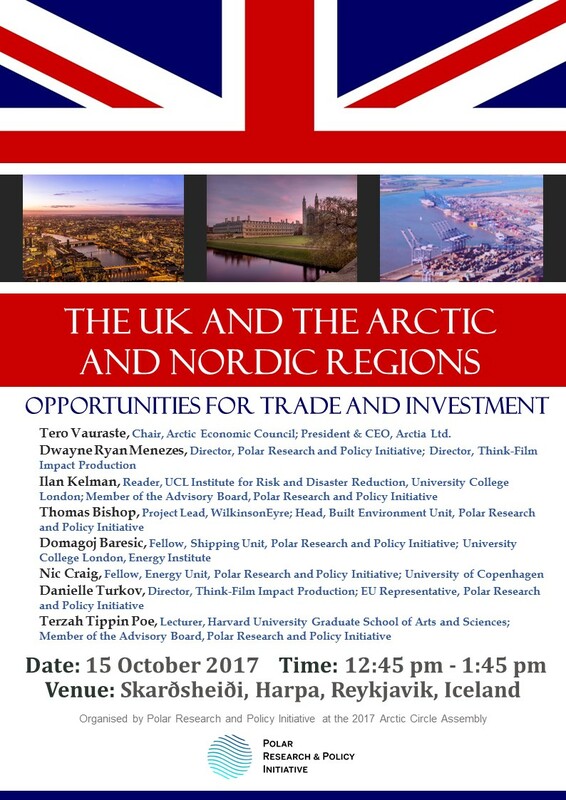 Polar Research and Policy Initiative hosted a discussion on ‘The UK and the Arctic and Nordic Regions: Opportunities for Trade and Investment’ on 15 October 2017 at the 2017 Arctic Circle Assembly in Reykjavik, Iceland. The session explored opportunities for trade and investment between the UK and the Arctic and Nordic regions. It brought together speakers representing different sectors: infrastructure; architecture; shipping; energy; education; and arts and culture, whose presentations highlighted strengths and opportunities in their particular sectors, with time allocated for Q&A. The key objective of the panel was to help our guests to understand what opportunities might exist, and how best they can access the UK market. Tero Vauraste, Chair, Arctic Economic Council; President & CEO, Arctia Ltd.